You support people’s personal development successfully if you let things show themselves as they are and not only explain them with words. This way encounters happen which open powerful possibilities hidden before. 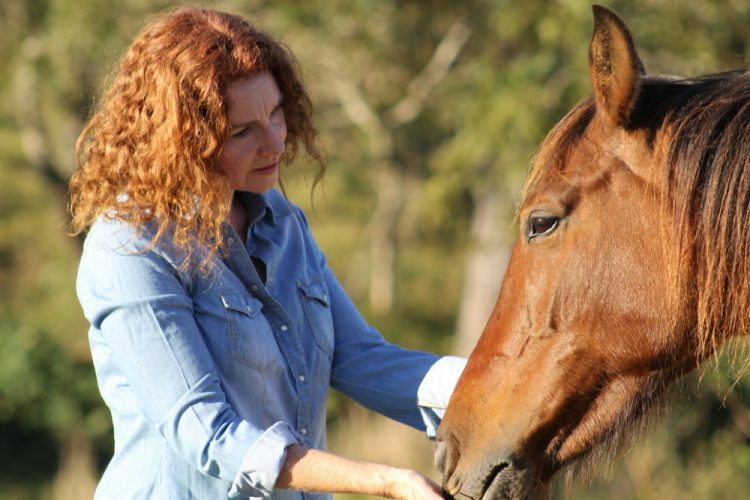 A few weeks ago I had the great opportunity of learning more about one fascinating method which works very much in this direction: Equine Assisted Learning, that is, learning about yourself or your team by means of an encounter with one or more horses. On that very special day, colleague and friend Tiffany Scotton took me on a short drive from Sydney’s Inner West to Richmond, NSW. There she had arranged to meet equine expert Jackie Smith, an openhearted woman I inmediately liked. Jackie showed us the spot we were in, called The New Secret Garden: paddocks for horses, a pond, areas to sit outside in the shadow, a seminar room… All has been developed and built by people with mental or physical challenges, together with volunteers supporting them. A very impressive achievement indeed. But Jackie’s clients are not challenged people. They are either individuals or – more often – teams from different companies in Australia. After showing us around and asking us about our previous experience with horses and our expectations for today, Jackie proceeds to guide us through a short meditation exercise, exactly in the way she usually starts with real clients. With this exercise you become aware of your body and your sensations here and now. It is important to get in touch with yourself before you go into the paddock and get in touch with the horse, as in this encounter there will be a lot of information exchange happening at a nonverbal level. During the meditation exercise, Tiffany has come across an uneasy feeling at a particular point of her body. We both came for the purpose of an exchange between colleagues and have therefore no real agenda for today, so Jackie suggests Tiffany to choose this feeling as the issue for the encounter with the horse, Edgar, and just observe and explore what happens with it. We have been on the other side of the fence so far and Edgar has been looking at us from time to time, running fast and showing an amazing amount of energy. Jacquie is surprised. Edgar is usually a quiet, peaceful horse, used to having people around and happy to interact with them. However, today there are workers gardening, using loud machines. For her clients, Jackie always chooses days in which the spot is less busy and the horses tend to be relaxed. Jackie and Tiff go into the paddock and walk right to the centre of it while I stay outside. What happens in the next half an hour could be described in two ways. Either „nothing“ or „lots of stuff“. Nothing, because – oh surprise – there was no interaction in the way you see in films or stories, of the kind: horse greets person, person greets horse, happiness and peace all around. Lots of stuff though, because indeed there is so much going on. Jackie observing the horse and speaking to Tiffany. Tiffany making careful attempts to getting close to Edgar. He walking and trapping along the fence of the paddock back and forth and showing really scarce interest in the two people near him. The end of the story is that Tiffany manages to touch Edgar very slightly on the right part of his face, and that he again starts to run even more energetically inside the paddock. Eventually both women come out to this side of the fence again and a conversation between us three follows. We reflect: Edgar was nervous and energetic from the very beginning. There was loud work going on in the next paddock and there might have been also other things disturbing him. We both came for a short time lapse of time, so we did not have the opportunity to get to know the horse properly, or to change the setting, or to very gradually get in touch with him, as real clients do. And this is what happened to Tiffany’s uneasy feeling mentioned above: It softened as she dealt with other issues which arose when she was observing the horse. So what do we learn from this? Well, as it happens so many times in life, things turn out to be different from what you had expected, so the best way of dealing with this is to just accept them. Jackie confirmed that most people have a similar experience when they come to her for the first time: they expect big things to happen but then „nothing“ occurs. And what this „nothing“ means is strongly related to the issues people bring to the Equine Assisted Learning. As Jackie puts it: „If you are ready to see what is actually there, and not what you want or had expected, then you are ready for an encounter with the horse“.